Time Equities Inc. Art-in-Buildings is pleased to announce the newest exhibition at the West 10th Window: Greg Smith, Breakdown Lane. In Breakdown Lane, Greg Smith presents a video excerpt from his performance-based video work of the same name. 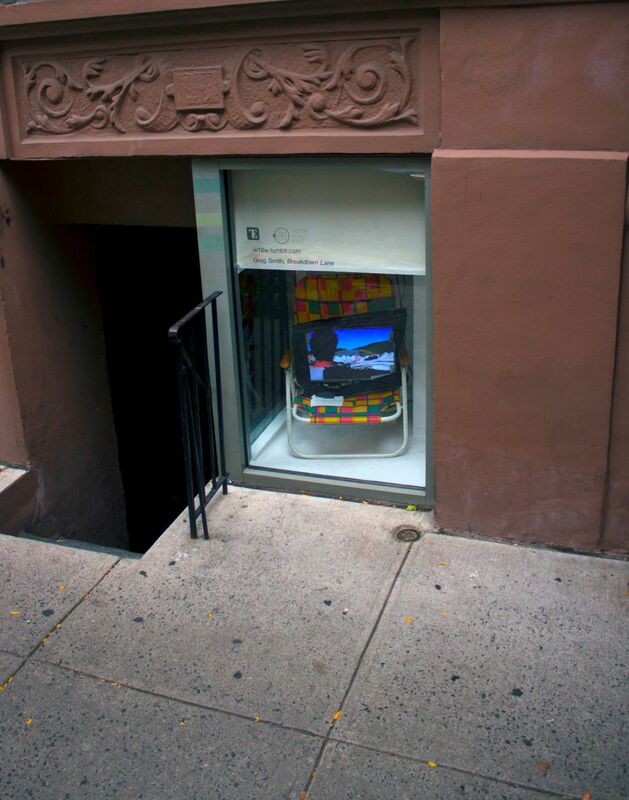 The installation in the tight West 10th Window space provides a new context for the video's focus on the fraught promise of wide-open space and speed that is part of the American mythology. 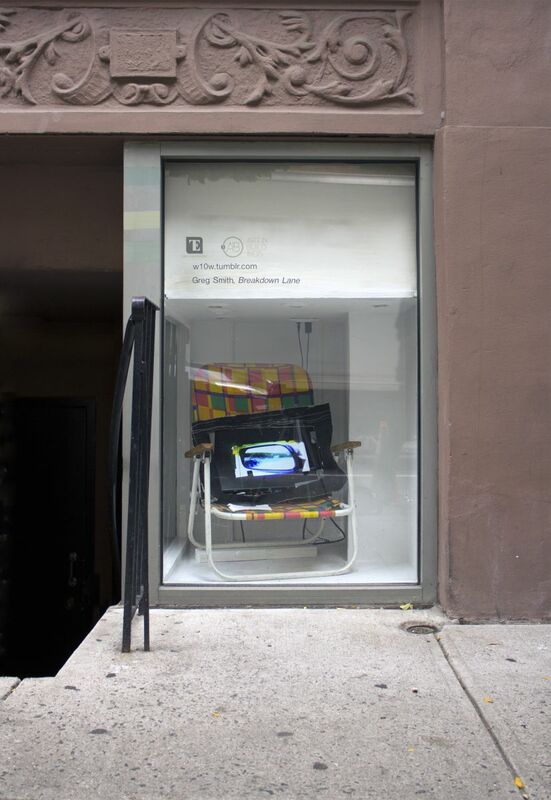 In Smith's installation, the video loops on a monitor that rests on a small folding beach chair that takes up the entirety of the window. Breakdown Lane subverts the road movie genre, which typically celebrates velocity, freedom, the car, and the vastness of America's open country framed by a distant horizon. In Smith's video, space is cramped, and the car is filled with video monitors and a bathtub. The protagonist alternates between standing stranded on the side of the highway, and hurtling ahead in a car with the help of rickety mechanisms that control the car's pedals and steering wheel. Honoring the genre, the protagonist remains fixated on the ever-present yet untouchable horizon. It is a perpetual promise of something better, a celebration of the independence of the open road, and a constant reminder of failure. Cramped and facing backwards as he drives, the protagonist carefully watches monitors displaying the driver seat's view of the open road. 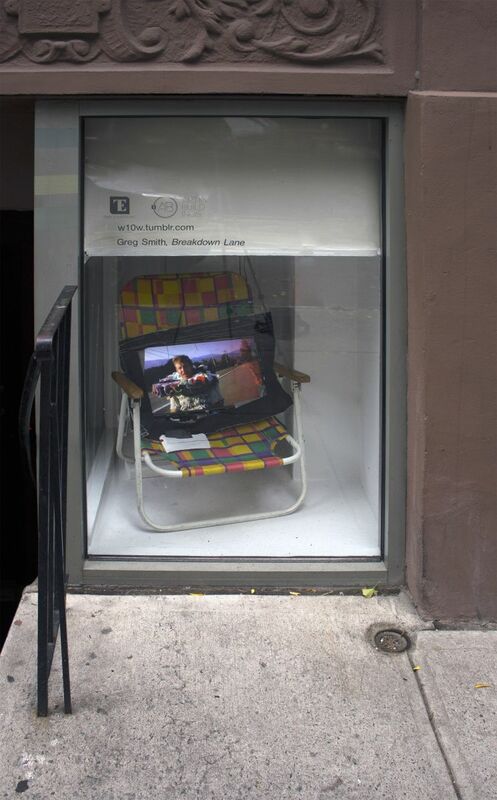 In Breakdown Lane at the West 10th Window, Smith recontextualizes this relationship between viewer and screen. 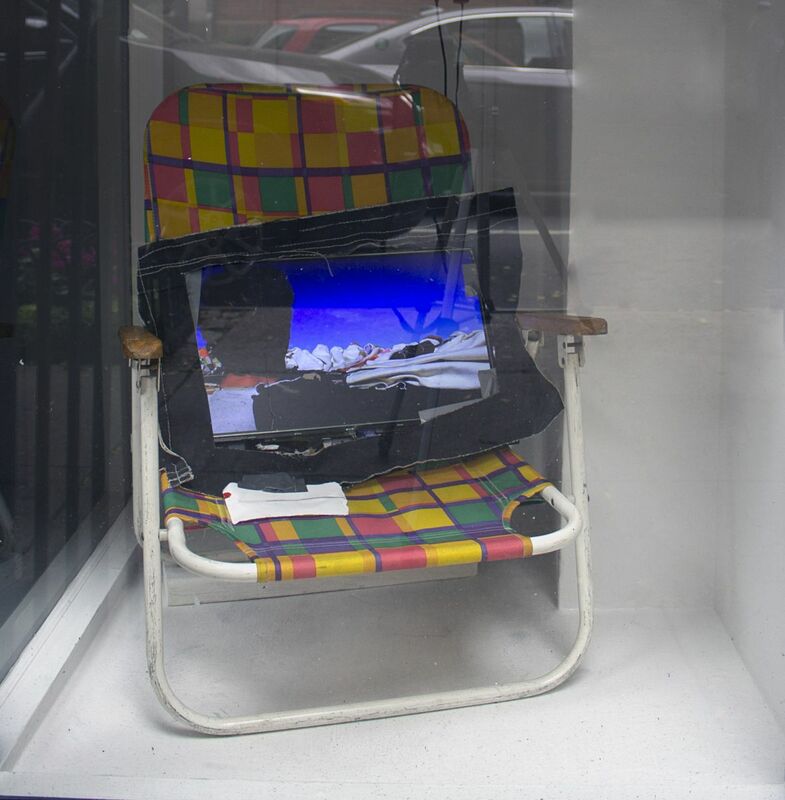 The tight spaces depicted in the video mirror those of the installation, while passersby of the West 10th Window are encouraged to mimic the actions of the protagonist by watching the monitor before them. 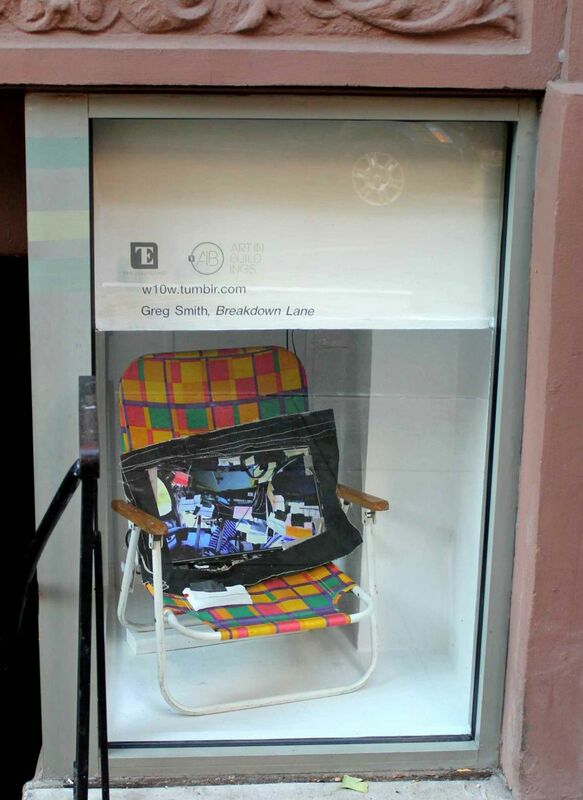 Greg Smith's art practice consists of installation art, sculpture, and video. Born in DeKalb, IL, Smith received his BA from Amherst College, a PhD from Harvard University, and finally an MFA from Hunter College in 2005. Smith has exhibited artwork nationally and internationally. Outside of New York, he has had solo shows in Chattanooga TN, Chicago IL, and Grinnell IA. He has also participated in group exhibitions at institutions nationally; The Atlanta Contemporary Art Center in Atlanta, GA, Weatherspoon Art Museum in Greensboro, NC, and Hudson Valley Center for Contemporary Art in Peekskill, NY. This includes film screenings at the Museum of Modern Art in NYC and Galapagos Art Space in Brooklyn. Reviews of his work have appeared in The Brooklyn Rail, Hyperallergic, and Paper Mag. Smith has representation in New York with the Susan Inglett Gallery. Smith has also received awards and grants for achievements in his art, most notably the John Guggenheim Fellowship in 2013 for Film and Video. He has also received the Manhattan Community Arts Fund Grant in 2010 and the Rema Hort Mann Foundation Art Grant. Next up at the West 10th Window: Melissa Jordan, David Stein, and Christina Watka. 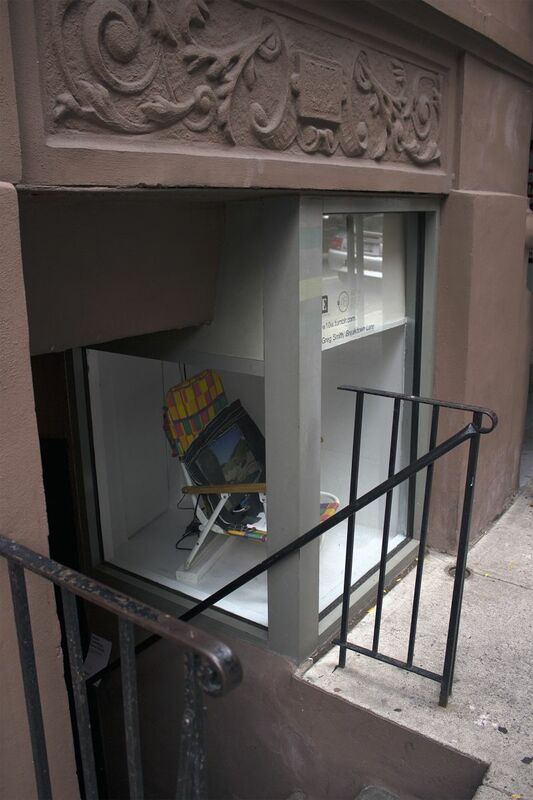 The West 10th Street Window is curated by Natalie Diaz, Jennie Lamensdorf, and Eliana Blechman and is sponsored by the Time Equities Inc. (TEI) Art-in-Buildings Program. TEI is committed to enriching the experience of our properties through the Art-in-Buildings Program, an innovative approach that brings contemporary art by emerging and mid-career artists to non-traditional exhibition spaces in the interest of promoting artists, expanding the audience for art, and creating a more interesting environment for our building occupants, residents, and their guests.